More than half of our communities need to plant more trees and all of them need to develop more ecological landscapes. You can make our communities healthier places to live, work and play! 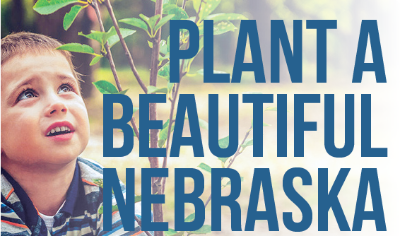 The Greener Nebraska Towns initiative is a three year push for tree planting and ecological gardens across Nebraska. 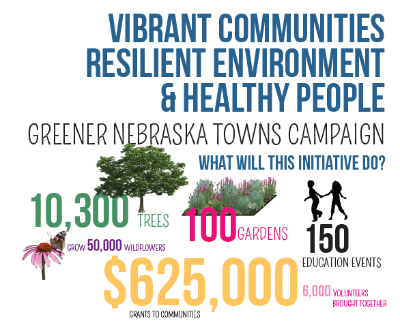 You can support the Greener Nebraska Towns Initiative through your gift, which can be pledged over a 3-year period. Learn more about the initiative. One time gifts by check or credit card. Send in the pledge form with your check. Or make a credit card donation online today. Printable pledge form and online pledge form with payment capability. Monthly gifts. Split your gift out monthly. For example a $720 pledge would be $20/month over three years. A $300 pledge would be $8.33 a month over three years. You can do this by filling out the online pledge form. In the payment portion of the form make sure you click the box that says "Give Monthly". OR contact us and we can get you set up with ACH withdrawal. Quarterly gifts. Split your pledge over quarters. For example a $3,000 pledge is $250 per quarter. We will send a pledge reminder each quarter. Printable pledge form or online pledge form with payment capability. Yearly gifts. Fill out the pledge form and we will bill you yearly on the date of your choice. Some folks go ahead submit the first payment. That works too! Others pledge now and pay later. Printable pledge form or online pledge form with payment capability. What if I do a stretch pledge and my circumstances change? Life happens and we can revise or cancel the pledge, just contact us. I would rather give other assets. How else can I give? Stocks, Charitable IRA Rollovers, Gifts of Grain, etc. For some people gifts of assets are the best means of giving. Some members have found that they can give more through these means, or even give a major gift to help build an endowment to fund projects like this long term. Contact Christina Hoyt by e-mail or by phone 402-472-5049 to discuss options. NSA has accounts with both the Nebraska Community Foundation and the University of Nebraska Foundation that help handle gifts like this. My resources are limited today, but I can give more in the future. Consider putting the Nebraska Statewide Arboretum in your estate plans. Contact us about how we can honor you now for your future gift.